This is my entry into the Bald Archy Prize 2019. It is a complex piece, borne out of a necessity to see how many expressions and essence of character I could get in to one picture while still maintaining integrity with a holistic picture. A PM Pastiche. I wanted viewers to stop and look at this and use their hands to block out sections of the work to see who they can see. 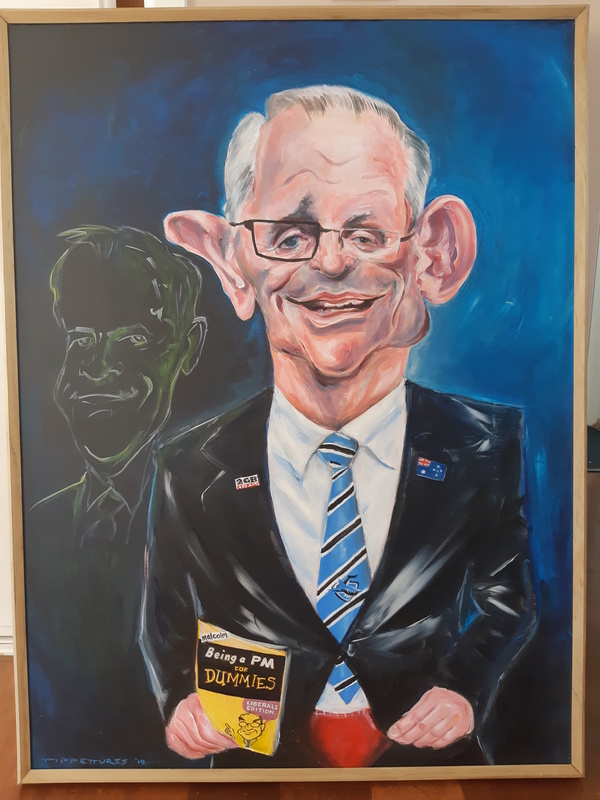 I wanted it to look like one of the portraits in the Parliament House Gallery and added an extra element of a thin wooden frame stuck onto the canvas. The result is intriguing and thankfully has received some press within the Capital’s writers. The Prize this year opens in the ACT on Feb 4 and travels around the eastern seaboard, with the winner announced in Sydney in March. This effort didn’t make the grade to hang in this year’s Bald Archy, but with each passing day its message is no more truer – so many useless distractions within our present government there seems no way out. Enjoy my work ‘The Australian Voter’ and let’s hope for some policies to continue improving our way of life to pass rather than the soap opera on the Hill.